How can I send automated InMails? 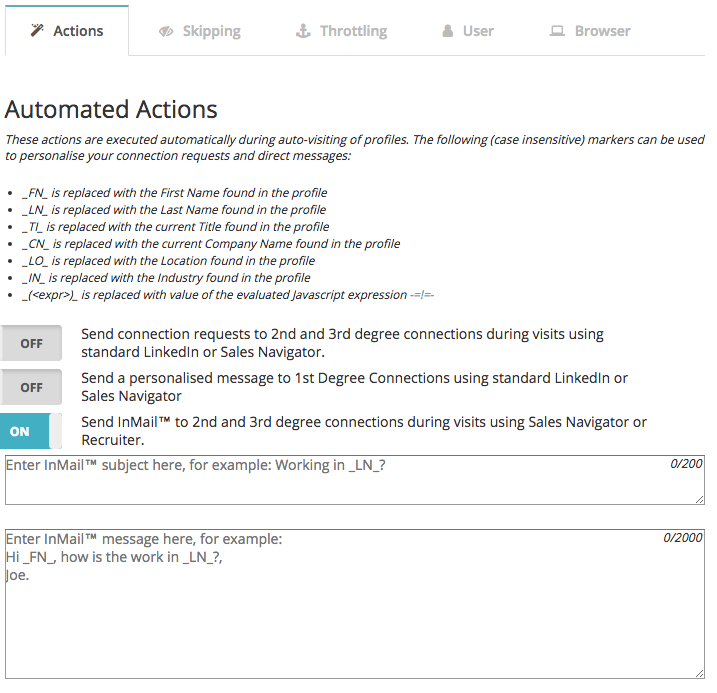 InMails are messages sent directly to a LinkedIn person you are not connected to. InMails are widely used by recruiters who cannot use invitations to connect with potential candidates. It can also be used by other users to build a relationship. Note: you can accumulate InMail credits from month to month, but they will expire after 90 days. First, please click on Dux-Soup icon on your browser and click on Options. Here you enter your subject line and the main message. When your message is ready, close the options window and go back to your Sales Navigator or Recruiter account. Select your filters and when you are ready, click to "Visit Profiles" on Dux-Soup menu. Now Dux-Soup will start sending InMails to each profile in your list until it’s used all of your credits. Please note - to purchase the credits, you need to it on your LinkedIn as Dux-Soup does not sell them.